The world, like the Tower of Babel or my grandmother's deck of cards, was made out of stories, and it was always on the verge of collapse. How does a single life become a story and a story encapsulate a world? Moonglow: a novel unfolding in a final, deathbed, confession. An old man, his tongue loosened by powerful painkillers, his memory stirred by the imminence of death, tells stories to his grandson, uncovering bits and pieces of a history long buried. Why did he try to strangle a former business partner with a telephone cord? What was he thinking when he and a buddy set explosives on a bridge in Washington, D.C.? What did he feel while he hunted down Wernher von Braun in Germany? And what did he see in the young girl he met in Baltimore after returning home from the war? 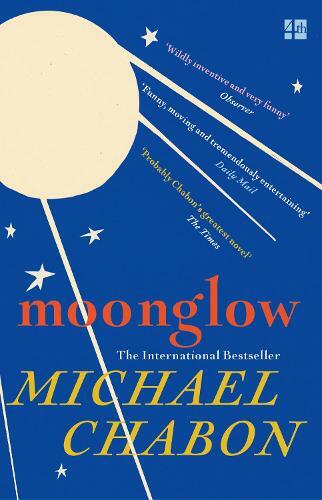 From the Jewish slums of pre-war Philadelphia to the invasion of Germany, from a Florida retirement village to the penal utopia of a New York prison, from the heyday of the space programme to the twilight of 'the American Century', Moonglow collapses an era into a single life and a lifetime into a single week. Michael Chabon has long been a favourite of Waterstones’ with his tour-de-force novel The Amazing Adventures of Kavalier & Klay never lacking an ardent bookseller review. A Pulitzer Prize-winner with a seemingly endless capacity for creative invention and reinvention Chabon’s novels refuse to be pigeon-holed with his successes including variously the alternate history The Yiddish Policemen’s Union, a headlong caper about writing and scholarship, The Wonder Boys, a reworking of a classic detective novel in The Final Solution and his own take on the long realist novel, Telegraph Avenue.